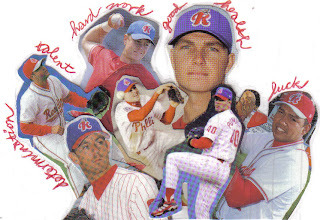 I saw Team China play twice last October in the Arizona Fall League and used two of the Polaroid photos I took then to make this composite image. This year is supposed to be the last for baseball to appear in the Olympics. 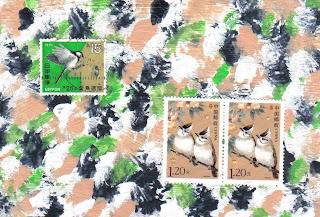 I'm sending the postcard to my friend Yue in Xiamen. 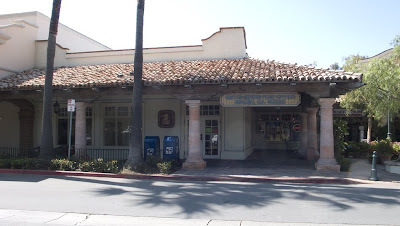 A mellow Southern California post office situated in a mall. Love the palm trees alongside. 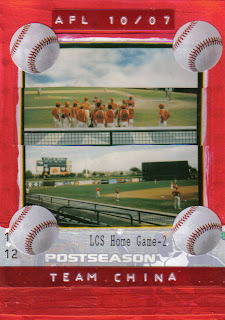 I plucked this card from the archives (of last summer) to send in reply to Mrs. October. 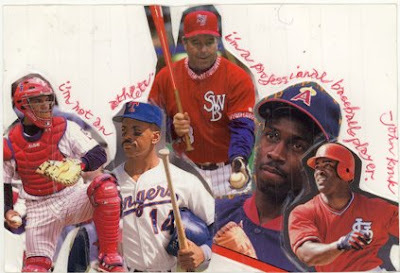 Some of these guys had what it takes to make it to the majors. Some are still there. Jessie Foyle, aka Mrs. October, has sent another (!) 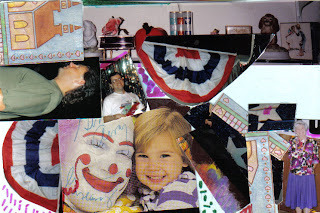 collaged postcard, this one mainly made of photographs from her many albums. The empty blue space has glue marks on it, which makes me think an element fell off in the mail. I'll be going with Jessie to a game next week and hope to hear about it all. When potter Willi Singleton announces a new show, he usually does it with a postcard drawing of some aspect of the work that went into making the pots. I've already got enough of these casual but interesting drawings to make a book. 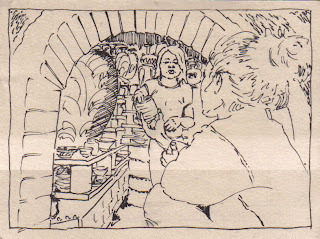 This one shows his wife and daughter helping out in the kiln. New Pots from the Spring Firing will be held next weekend June 7 and 8 at Pine Creek Pottery in Kempton, PA. 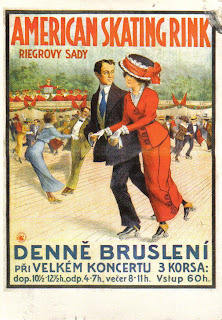 Friend Jozef B. picked up this reproduction of a Czech postcard c. 1908 at a museum of decorative arts in Prague. Jozef was there with some of his art students from Buffalo and is now traveling with them in his native Slovakia. Fumiko K., an organic farmer friend in Tono, sent this sheet of stationery in a recent letter. Fumiko and her husband are now building a house and seem to have lucked out with a wonderful carpenter. The carpenter's wife made the stationery. Sweet stuff! Old friends now in Vermont sent this glowing birthday postcard. 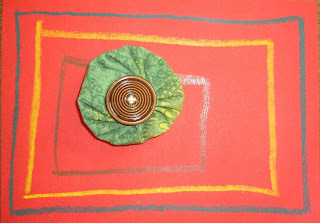 It's a photograph from Linda Durkee's Garden Series. I wonder if the lilacs are now blooming in Vermont. This clever handmade card came from Finnish postcrosser Anu. Thanks for the delightful surprise! Friend Yue is thrilled that the Olympic torch is making its way across mainland China. 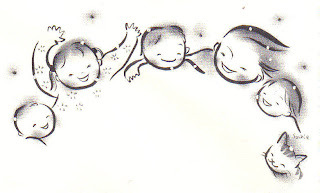 She sent these stamp images on a postcard of the red Olympic mascot. 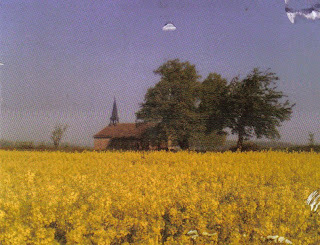 Old church, old trees, field of blossoms. My first glance at this card, which German postcrosser Manuela made from a photo taken on her cell phone, brought three places to mind. Germany was not one. Manuela says the canola fields are now in bloom, which sounds about right. During a long rain delay at Sunday's baseball game in Reading, I drove up Mt. Penn to the Reading Pagoda gift shop. 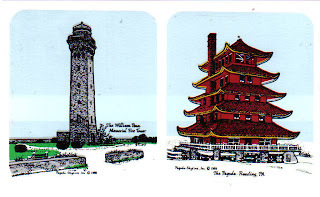 This unusual decal postcard shows two Reading landmarks. The Pagoda is now celebrating its 100th anniversary. A local entrepreneur built the Pagoda on top of Mt. Penn in 1908, with the idea of making it a resort. That never happened. For the most part the bizarre structure, built of concrete and tiles, was not used for much of anything. For a period long ago, Morse code signals were flashed from the Pagoda to alert townspeople to fires and to broadcast the results of events, such as the World Series. Friend Sandy is on a roll. Today's mail brought this beautiful birthday postcard. 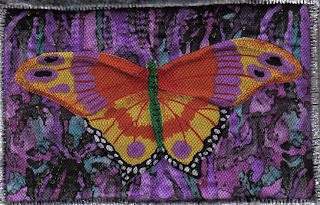 Sandy makes great fabric postcards. Thanks so much! From sea horses to armadillos, we cover the animal world. 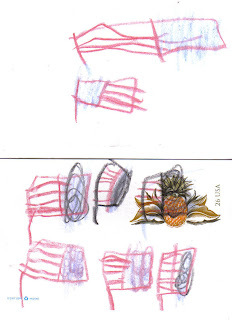 Sandy S. picked up this card of a "little armored one" in the Dallas airport on her way to Mexico. 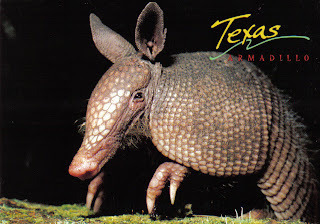 The card tells me that the armadillo originally came to Texas from Mexico. Another amazing creature. A German postcrosser said she wanted a sea horse postcard. 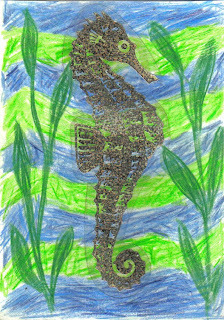 I used colored pencils and a plasticized sea horse image that I happened to have to make this one. Will it reach its destination? 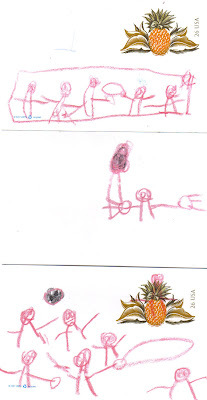 More cards from the twins, now in England, soon on their way to Rome. 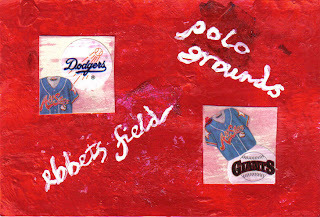 The California twins Jonathan and Alistair sent this triptych of baseball images before they left for a summer trip to Europe. Thanks, boys! There's an ice cream cone somewhere in there, says their mom. I bought this card yesterday at the gift shop of the Reading Pagoda, atop Mt. Penn, which had a surprising variety of postcards. This one is classic. 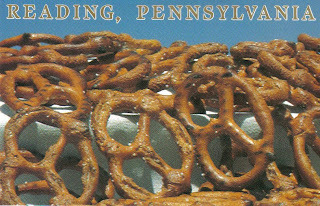 Pennsylvania is known for its pretzels; the Reading area is a center of pretzel making. Love the design, the lettering, the colors of this card. The old apple tree out back was in glorious bloom a couple of weeks ago and prompted me to make this card, which I sent to a friend in Tono. 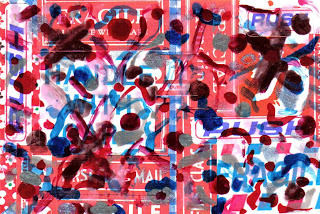 German postcrosser Phoenix N. sent this postcard. 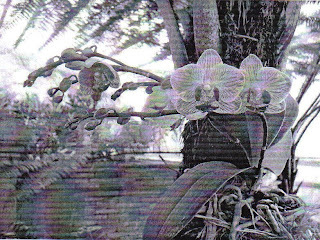 She made it from a print-out of a photograph she took this April in the Balinese garden in Berlin. Interesting in black and white. 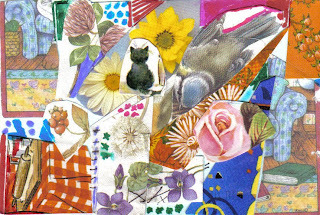 Mrs. October has surprised again with this postcard featuring a spring collage. Thanks very much, Jessie! Some smoke, huh? 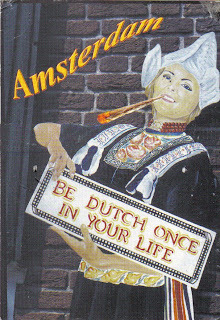 This card arrived from Dutch postcrosser Diana, on a day of relentless rain. What a giggle! 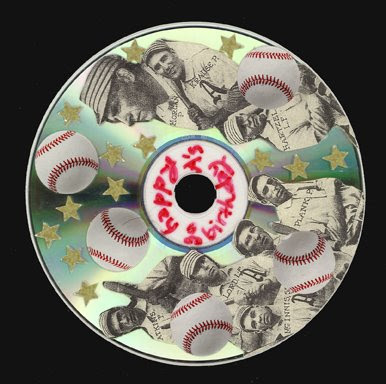 Jacqueline sent me this delightful CD collage of Philadelphia Athletics for my birthday. A baseball lineup from Jacqueline. This postcard is for a Finnish postcrosser named Mira, a 19-year-old DIY'er and art student who lives in a village by the sea and loves spending time in her atelier. I made the card using a pamphlet from Journeys East, paper doilies, and acrylics. 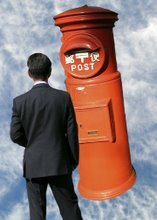 Hope Mira sends a card here! A couple of old Polaroid images went into this homage to two of my favorite ballparks, Citizens Bank Park in Philadelphia and PNC Park in Pittsburgh. For different reasons, they are two of the absolute best of the new ballparks. A Brazilian postcrosser said she was unable to live without ice cream or nail polish. I was going to send her a card I had made last summer, then started doodling on it with nail polish. It turned into a bit of a nightmare. Well, she also said she welcomed weird cards, so here goes. I somehow doubt that it will make it through the mails. 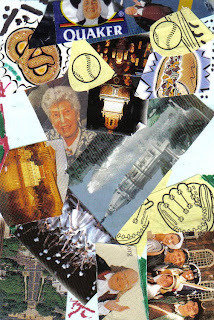 A German postcrosser asked for postcards that reflected a "hobby". 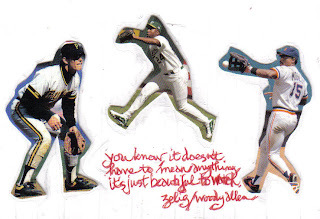 I've sent him this card I made last year, all about one of my big passions: baseball. May 10 is Mother's Day in Mexico so here goes this card I made for my mother for tomorrow. She'll be celebrating at the ballpark. 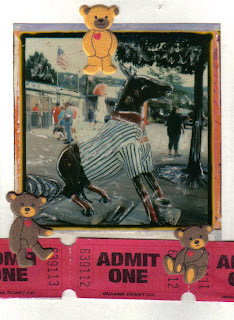 This Polaroid is of the old Red Barons' park in Moosic. She'll be at the new IronPigs' park in the Lehigh Valley. This wonderful cutout card arrived on a gloomy, rainy afternoon when we are on a flood watch. 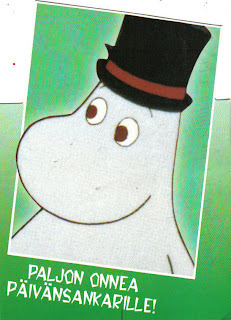 Many thanks to Finnish postcrosser Pirjo, who wrote, "This Moomi says lot of luck to the birthday hero." Not that she knew it, but my birthday is later this month. 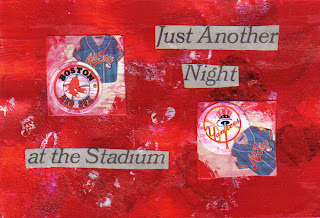 Another headline, this time from the NY Times, makes an ironic comment on the Yanks-Red Sox rivalry. Any game between the two is also sure to go long into the night. 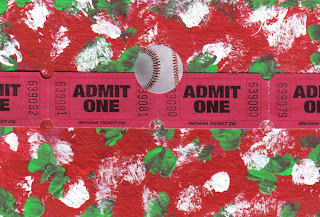 I sent this card to a friend in Obama, on the coast of the Sea of Japan, who is a big Matsui fan. The Dutch postcrosser (below) freaked out over the skunk cabbage card. She couldn't figure out if it was a skunk or a rotting animal. Sigh. 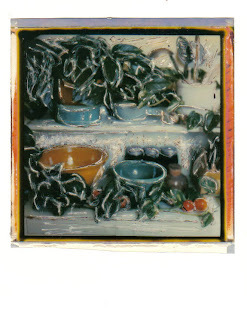 I hope my friend Louisa takes this altered image of her kitchen shelves in stride. Guess who that woman is. 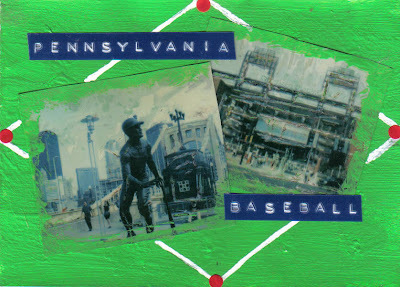 Yes, Mrs. October comes out of left field with this second collaged postcard, which plays on images of Philadelphia. What a treat! 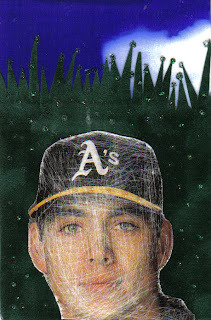 Mrpotani says that A's fans used to call this nameless (to me) player "old blue eyes" for his big baby blues. Blue skies, green grass: play ball. I made this card for Anu V. of Finland. 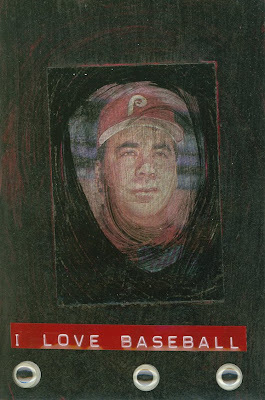 It's made of an old Phillies baseball card, paint, google eyes and dymo. 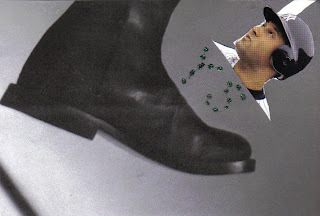 Mrpotani, not a Jeter fan, gives the captain the boot in this amusing collaged postcard. Cinco de mayo is not the only holiday today. 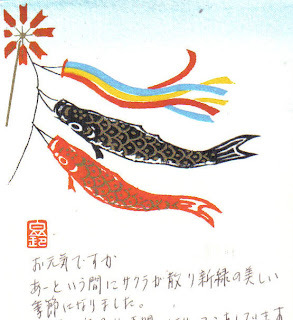 In Japan it's Children's Day (kodomono hi), the traditional boys' day, when cloth carp were flown to show that a boy had been born into the household. Tokyo friend Motoko T. sent the greetings. 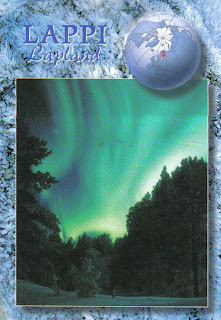 Finnish postcrosser Tuija sent this wonderful shot of the aurora borealis in Lapland, with a cool hologram stamp affixed. The San Francisco Giants are in town and it prompted me to think about their big rivalry, with the Dodgers. When the two teams were in New York, the Giants were the powerhouse. That changed when they both moved west. The SF Giants are still looking for a World Series win. The LA Dodgers have a handful. 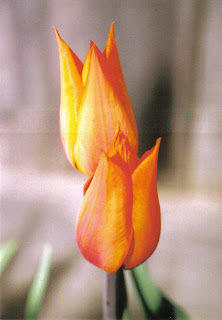 A Dutch postcrosser said that she welcomed favorite photographs. 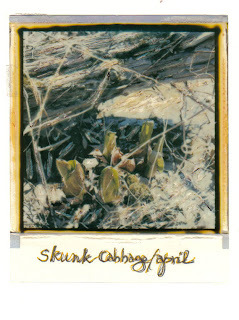 I wonder if she will like this altered Polaroid of the skunk cabbage in the swamp across the road. Sprouting skunk cabbage is a sure sign of spring. 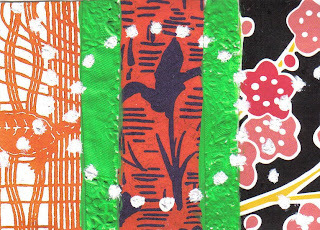 May Day wishes for my friend Kei, made from recycled cardboard, acrylics, and used stamps. 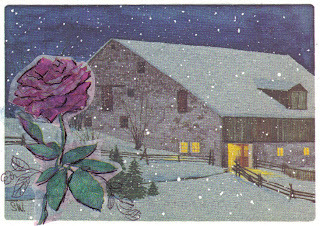 Sandy S. called this card "Everyday's a holiday". I half-wish she had saved it as a cooling treat for the dog days of summer.